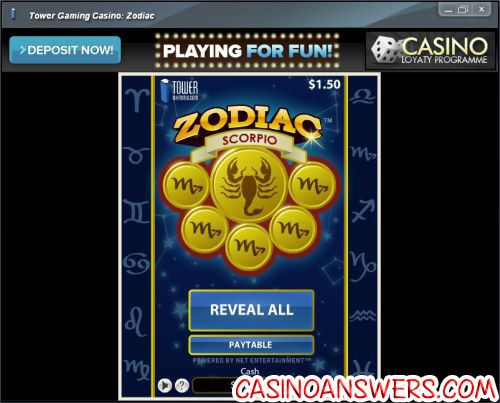 Zodiac Scratch Card Guide & Review - Casino Answers! Zodiac is an online scratch card game developed by Net Entertainment. You can play the Zodiac scratch card at Tower Gaming Casino or Cherry Casino. The Zodiac instant scratch ticket game is fixed at $1.50 per game. To play, simply hit the “Buy Ticket” button and click the large circle to reveal the prize. Then, you must match two of the remaining five circles to your chosen sign. If you are able to do so successfully, you will win the prize listed on the large circle. Click on each circle to scratch the card or hit “Reveal All” for faster play. To try out the Zodiac scratch card before playing, you can use the demo button so you can get the hang of it first. You can try Zodiac out right now by playing at Tower Gaming Casino. Prizes on the Zodiac scratch-it game are (number of unique tickets in parenthesis): $1.50 (200,000), $3 (150,000), $6 (70,000), $9 (18,000), $12 (8,000), $15 (2,000), $30 (400), $50 (100), $200 (50), $1,000 (10), $2,000 (5), $10,000 (2) and $25,000 (2). The number of unique tickets listed is based on 1,200,000 available tickets. If you’re the type who reads your horoscope on a regular basis, you may be interested in trying the Zodiac scratch card lottery game. You never know, your sign may bring you the luck you need to win up to $25,000! That’s a pretty big win for a game that will only cost you $1.50. To see if your astrological sign will bring you luck, play the Zodiac online scratch ticket game at Tower Gaming Casino! Are players from the United States able to play the Zodiac scratch-off game for real money? Unfortunately, American players cannot play at Net Ent online casinos such as Tower Gaming Casino and thus cannot play the Zodiac scratch card for real money. On the bright side, players from the United States can play a good selection of scratch cards complete with progressive jackpots at Winpalace Casino. Can Macintosh players play the Zodiac scratch card game? Mac users not only have the option of Instant Play, but they can also download the Tower Gaming Casino client and play Zodiac using the Tower Casino software! Is there a free Flash game of the Zodiac scratch lottery game? Yes, you can play the Zodiac scratch card for free or for real money at Tower Gaming Flash Casino or Cherry Flash Casino. If you experience any issues with the Instant Play Flash casino software, make sure you have the latest version of Adobe Flash Player installed on your computer.